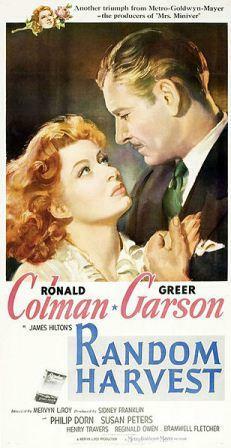 Random Harvest (1942): A prime example of cinematic melodrama, with Greer Garson (Is there a lovelier star?) and Ronald Colman (Is there one more debonair?). As a shell-shocked WWI soldier, Colman loses, sort of regains, but then reloses major chunks of two highly disparate lives through traumatic amnesia. And while his brain remains broken and his existence is stubbornly compartmentalized, Garson is the common thread—attempting to mend the wounded veteran through tireless, selfless love. Aw, gee [sigh].